John Davies was a San Diego attorney and civic leader who is perhaps best known for how he helped to shape the state’s judicial appointments process. He served as Gov. Pete Wilson’s judicial appointments secretary from 1995 – 1999 and was judicial advisor to Gov. Arnold Schwarzenegger from 2004 – 2007, when he helped to establish the current judicial appointment and screening process. He was also chair of the California Judicial Qualification Committee from 1983-1992 for two different senators. Through his work, Mr. Davies influenced the appointment of more than 600 state judges and 35 federal appointees. A Chula Vista native, Mr. Davies graduated from the University of Southern California before entering the U.S. Navy for three years. He then went on to earn his law degree at University of California Berkeley’s Boalt Hall School of law in 1962. After law school, he practiced alongside his father, Lowell Davies at Davies and Burch. He then went on to be a founding partner of the San Diego office of Hahn Cazier Hough & Leff. He left to become a partner at Morgan Lewis & Bockius before joining Allen Matkins Leck Gamble Mallory & Natsis in 1993 where he focused on real estate and estate planning. 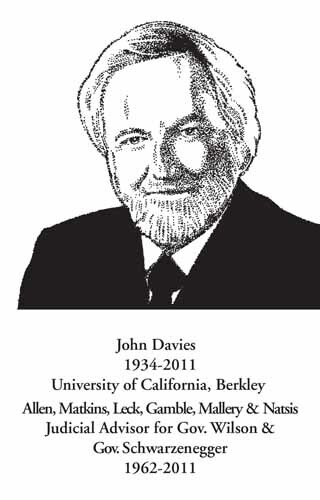 Mr. Davies served on countless boards in both the public and private realms. He was a trustee at the UCSD Foundation for nearly two decades and sat on the boards of Rady Children’s Hospital of San Diego and H.G. Fenton Company. Throughout the years, he also served as director of several companies, including Winfield Industries, Fisher Scientific Group, IMED Corp. and IVAC Corp. Shortly before his passing, he and his wife Ann were awarded the University of California, San Diego’s Chancellor’s Medal, one of the university’s highest honors given for exceptional service in support of UCSD’s mission.